As you know, I am a big fan of flourless treats. These Flourless Almond Joy Blondies are the latest creation. I got the idea as I was trying to go to sleep the other night. Yes I think about food all the time lol! So in the morning I stopped by the store to pick up everything that I needed . These Flourless Almond Joy Blondies were a huge hit. Especially with my 5 year old, who kept trying to sneak more and more bites. She had no idea these were made with beans! If you like flourless recipes, you may also like my Flourless Salted Caramel Chocolate Chip Cookies or my Flourless Healthy Chocolate Muffins. These decadent almond joy blondies are vegan, grain free and gluten free. You will seriously never taste the beans! These are that good. If you have been skeptical of desserts with beans, you really need to try! Trust me, one of the most popular recipes on my blog is my black bean brownies. 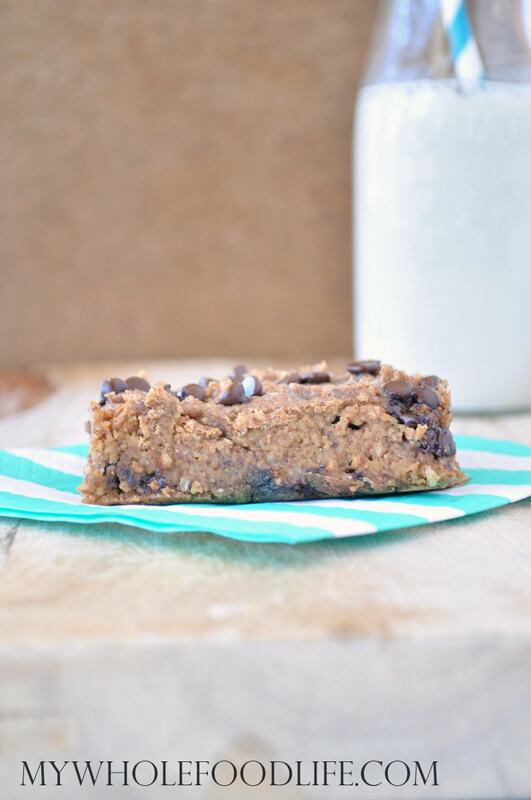 Healthy blondies with a secret boost of protein and fiber! Combine all the ingredients, except the chocolate chips, in a food processor and mix until smooth. Add the chocolate chips and pulse a few more times to get them mixed in evenly. Spoon batter into the glass baking dish. The mixture will be VERY sticky. I find wetting a spatula helps. Let the bars cool completely before removing from the dish. Cut into squares with a pizza cutter . Store these bars in the fridge. They should last a couple weeks. Enjoy!